Three transplants from California and Tijuana, Mexico dole out casual, authentic South of the Border eats (grilled cactus tacos, carne asada quesadillas) and homemade aguas frescas (horchata, tamarind) at a colorful Chelsea Market stand, decked out with hand-painted signs and subway tile counters. 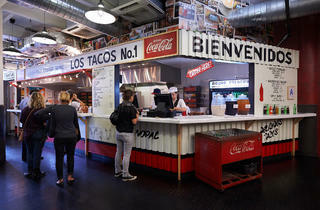 Los Tacos Number One, a shop in Chelsea market is probably one of my top places in the city to get a taco. I would've never thought so. I have so far tried the carne asada, pollo asado, and a little bit of the nopal. I was a little wary about trying grilled cactus, but also a little curious so my boyfriend ordered it and I had a bite. I did not like it. I'm sure if I liked cactus I would've thought they did it well, but the flavor was just offputting to me. The chicken and steak tacos were sooooo good though. There are a few simple ingredients, the steak, lettuce, tomato, with lots of options for sauce. So fresh and just yum! There isn't really a place to sit though so be prepared to eat these bad boys vertically. Definitely worth the trip though!! Everything on the menu is pretty much a slightly different version of the same thing but its all delicious! Wish there was a place to sit down, something Chelsea Market in general always seems to be lacking, but the tasty quesadillas (tacos with melted cheese) are THE BEST! They also have a large variety of Mexican beverages! Totally agree. This place is the bomb. You have to have an Adobada Taco and also some of the drinks too. 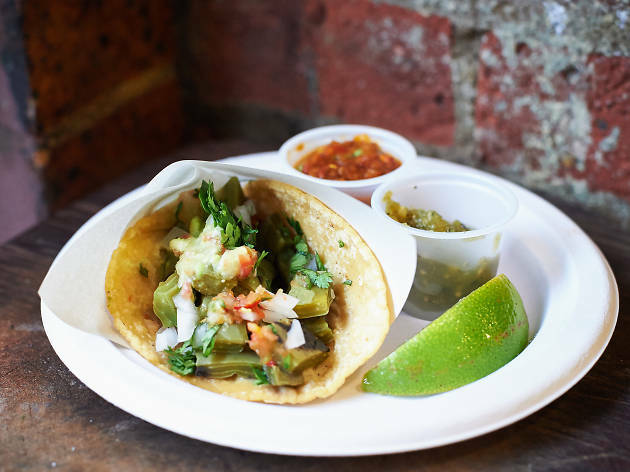 More than one friend has said - these are the best tacos in NYC. I tend to agree. The only thing missing is a place to sit down, but the chaos and pushiness of fellow starving taco lovers somehow ads to the street-food excitement. Nothing beats a handmade tortilla. Los Tacos No. 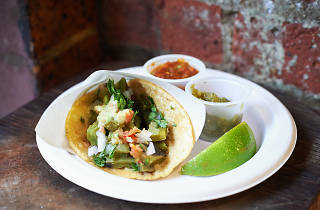 1 has become our benchmark when trying new taco spots in the city. You can't beat 'em! The best taco's I've ever had - The adobada tacos and steak tacos are ridiculous - can't describe - you just have to go - and don't expect a seat there ...there aren't any! Is there anything Questlove can do wrong? The answer is no. Case and point: tacos. Seriously? How does one even get into the taco game. I actually don't even care about the answer to that question, because whatever he's doing, it's working. All of the tacos are on point and I usually go for the corn tortillas with everything on it. You can even watch the tortillas being pressed fresh on site. Get chips and guac too. The line is usually long, but it moves fast, and you can't get better cheap eats anywhere in the area. Now take your delicious tacos and go find a spot on the High Line to eat them. Some of the greatest bites I've ever had in my life. After many recommendations, I decided to check out Los Tacos No. 1. I've only ever been to fake "Mexican" food knockoff places, so I never thought I would like Mexican food. I was so wrong. It was now time for authentic Mexican food, and what better place to do it than where most food can be ordered for under $5? I ordered a Carne Asada tostada. This must've been the fastest I've ever been given food after I ordered. And the tostada had everything one could ever have wanted. Come here. You won't be disappointed. Los Tacos No. 1 is indeed number 1 in my heart. 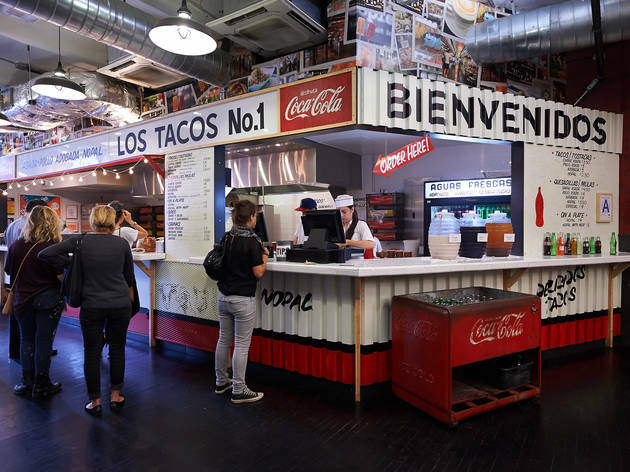 Located in Chelsea Market, this no frills taco stand does its job efficiently and well. While the menu may mirror any other Mexican place (think adobada, carne asada, nopal, etc...), the various taco toppings, ranging from fries to guacamole, propels this to the top. Every taco is also extremely tasteful and juicy, and can be further enhanced by their selection of free sauces. Their salsa verde is literally crack. Come here ASAP if you haven't already. 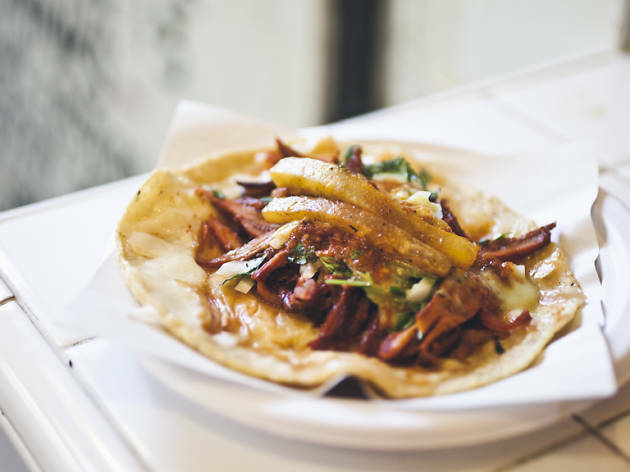 Authenticity is what Los Tacos takes seriously and it shines through in the flavors of their taco meats, salsas and fillings. Their legendary shells have a unique richness because of the addition of lard so if you like the soft, chewy texture and don't mind the extra calories, you're in for a treat. This place is truly authentic. Thankfully I am by chelsea market often, so I am able to get a taste whenever I want. Highly recommended for anyone who likes great Mexican. I go for the carne asada quesadilla and chips and salsa. It's the perfect meal under $10! I was born and raised in a town close to Tijuana in Mexico, and I know these tacos are 100% mexican; this is the real experience you get when you cross the border to Baja (except for the charcoal grill). 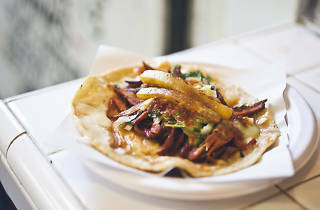 For Adobada (pork) use corn tortillas, for Carne Asada (steak) order a flour tortilla quesadilla. Sometimes they do have grilled jalapeños and scallions, ask for some of them to the guys serving the tacos.